• Includes 12-MSC plastic case (#4007). MSC 12 color Kit . #60 Poly in Plastic kit. 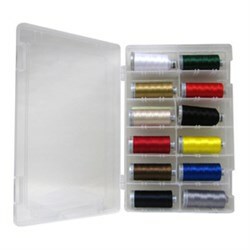 Use this mini snap cone kit of 12 pre-selected thread colors to enhance your thread collection! You're sure to find one you'll love.